Jockey Garrett Gomez won three races on Wednesday at Santa Anita, but fell $10,609 short of Jerry Bailey’s single year earnings record of $23,354,960 set in 2003. Gomez won aboard Warren’s Appeal in the third race, Twin Turbo in the fifth and Kyniska in the sixth, but could only muster a third place finish from Baroness Thatcher in the $70,000 featured seventh race. 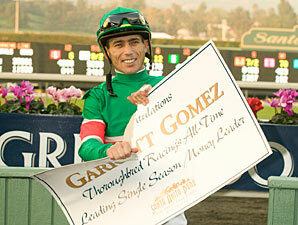 Still, Gomez made an unbelievable run at the record as he won with nine of his last 18 mounts dating back to Friday. He almost certainly would have passed Bailey, had it had not been for a freak occurrence on Saturday. During Saturday’s Eddie Logan Stakes, Gomez was riding Back At You, who had a clear lead in the stretch. But the lightly-raced 2-year-old tried to jump the inner rail as he approached a large shadow of the grandstand that darkened the turf course. Both Gomez and the horse crashed to the ground, but neither was seriously injured. According to Bloodhorse.com, Gomez, went to the hospital where he required cosmetic dental surgery to repair several broken front teeth. He also cut his knee and one of his hands was swollen. The fall required Gomez to take off his mounts Sunday and three of the horses that he was scheduled to ride ended up winning, including 7-to-5 favorite Proudinsky in the $150,000 San Gabriel Handicap. In total, the mounts Gomez was scheduled for Sunday earned $141,000 for their owners which would have shot Gomez purse earnings ahead of Bailey’s and broken the record. Coming into Wednesday, Gomez, who had earned $23,275,879 in purses for his owners, needed to win $79,081 more to eclipse Bailey’s total, but ended up with only $68,472.